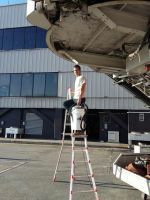 Southeast Bee Removal has received calls to remove honey bees in literally all kinds of places in the city of Atlanta. I never know where the next swarm or colony of honey bees will be found. I have done bee inspections and removed honey bees from a mailbox, trunk of a car, new Atlanta Braves stadium, and the Hartsfield-Jackson Atlanta International Airport. One of the largest top ten bee removal jobs I have ever done was undoubtedly in the Atlanta area in Marietta. The honey bees had been living in the wall of a rental property for at least three years, probably longer. The honey comb had filled the entire space between two studs from floor to ceiling of an eight foot wall. The bees ran out of space and moved over to the second set of studs and built an additional two foot section of honey comb down from the ceiling. Total amount of comb built was a 10 foot section. Total number of bees removed was over 60,000. Honey bees play an important role in the city of Atlanta. Backyard beekeeping has increased a great deal in recent years. The Metro Atlanta Beekeepers Association has grown to over 200 members. This is a result of people becoming more aware of the benefits that honey bees bring to the environment. Honey bees are hugely beneficial to community gardens and flowers as they are the main pollinator of these plants. Also who can resist the taste of pure local honey, which has so many health benefits. Many farmers markets in the Atlanta area sell raw local honey. In addition, two hotels in Atlanta, the Hyatt Regency's Polaris and the Four Seasons keep hives on the rooftops and serve the honey in their restaurants. While honey bees are important to Atlanta, who wants them in their house? Here at Southeast Bee Removal our goal is to keep you and your home safe and free of bee infestations, while at the same time providing a service that relocates honey bees instead of killing them. 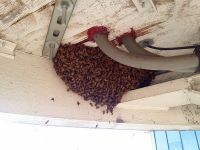 For expert bee removal in Atlanta give us a call today! Southeast Bee Removal services the Atlanta Metro area including: Marietta, Roswell, Alpharetta, Woodstock, Johns Creek, Lawrenceville, Sandy Springs, Decatur, Stone Mountain, Covington, Mcdonough, Peachtree City, Newnan, Douglasville, and the surrounding areas. Southeast Bee Removal on Atlanta's channel 2 news! Pictures Any pictures of the issue help.